A lot of people ask me about this particular topic, especially after they've done a massive declutter themselves, something like the KonMari Method. How do you (a) keep the decor and style simple and minimalist without feeling like it's barren and (b) keep the clutter out and the organizational systems in place? I can see why it's a concern, because I think it's inevitable that things creep back in and we want to do what we can to keep the progress we made. 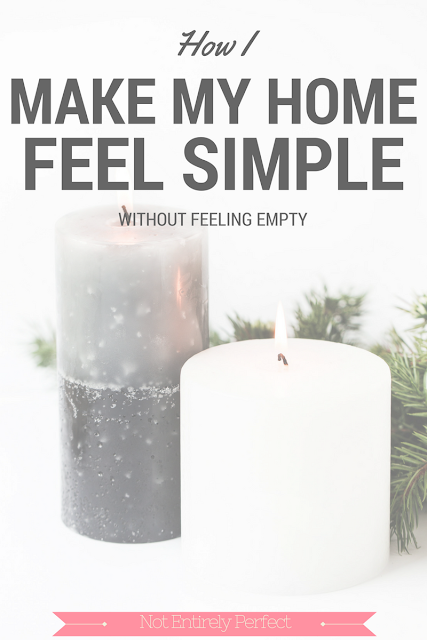 And a large part of wanting to overhaul the home and get rid of things is the desire for a simpler, easier, more calm life, at least at home. I agree with that part of it - the home should be a sanctuary, a calm away from the chaos of the outside world. So let's start there and tackle the 'how to keep the place organized and keep the clutter out' next week. Clear Surfaces. The number one tip is definitely to clear off all counter tops and table surfaces, to the extent you're able to. If it isn't something you use every day or a decor piece you really thought long and hard about, put it away. This is where all your drawer and cabinet space comes in handy. Clearing off the surfaces and storing items behind closed cabinet doors instantly makes such a huge difference in the look of a room and the home as a whole. The key to a simple aesthetic in a home is remembering that as your eye moves across a room, it shouldn't catch on too many things. If there's a lot of different, competing objects on surfaces then the eye doesn't know where to focus and you can get that overwhelming feeling of 'clutter!' even if the space doesn't have that many items in it anymore. As you can see in my kitchen, we don't keep appliances on the counters. I leave the coffee maker out because I use it daily (at least once, sometimes more than!) but otherwise, we don't have any other daily use items. The crock pot, the blender, the set of knives, all of those things can be stored. The kitchen instantly feels more simple and calm. I also apply this to the living room areas where the TVs are. I don't leave books or magazines out and the remotes stay corralled in a small area. Decor items are kept to a minimum. We don't have nightstands, but if we did I would want ones with drawers so I could put away things like the book I'm reading or my glasses. This also applies to our wall decor. I was never big on putting holes in walls in apartments, but I did have my fair share of photo collages going. Now we almost nothing on the walls and I like the clean, open feeling of that. We really just have the one statement piece, our Chicago flag pallet from RepChi, and it's something I look at and appreciate every day, instead of something lost among the many pieces that get ignored. Don't be so afraid of plain walls, it's still a statement. Light Colors and Patterns. As far as decorating our space, I really kept the pieces and decor as light as possible in terms of colors and patterns. They make a room feel more spacious and, like uncluttered surfaces, they aren't distracting to the eye. So light, solid neutrals are generally what I look for in our pieces, like our light grey couches, which carry over to the light greys and whites on our walls. This works in particular since we have the dark wood floors, it's a nice contrast. Bright colors and patterns are very distracting and attention catching, which is fine in moderation in a simply-styled home. I can always use bright red throw pillows on the couch at Christmas to really make a statement and change things up, because that's immediately what's going to catch the eye in an otherwise light colored and clutter free room. Something like that would bring a touch of something special to the area, rather than be overwhelming. So instead of grabbing whatever decor pieces catch my eye in HomeGoods, I take the time with the staple pieces to really make them blend, and I define an area by texture instead. On our living room couch we have this neutral throw pillow that have a very subtle pattern, but they have this rougher sort of linen texture that offsets them from the couch. They also vary from the grey and white plaid throw blanket we keep there, which is very soft and fuzzy. This keeps the area from looking and feeling too one-note and dull or unfinished. If you feel like you got rid of a lot of clutter and stashed away the things you had on your surfaces, but you still feel like your space isn't calm and simple, try seeing if you possibly have too many competing colors and patterns. Downsize. It seems simple but it always bears repeating, especially when transitioning from a basic declutter to actively styling a simple home. You have to have less stuff. The organizing aspect of a good declutter seems incredibly tempting, like you can have a simple and clean look to your home if you just perfectly organize your books on the bookshelf, line the shoes up by the door, or place all the DVDs in a storage rack. The problem with that is 150 books perfectly lined up on a bookcase still looks like 150 books. It very well might look like you have an organized home, but it definitely won't look like you have a simple, clean, calm, streamlined home, which is what I'm personally going for. Owning a lot of stuff just means having a lot of stuff around, in your space, changing the look and feel of your rooms. If you want to achieve a simple feel in your home, it really is about getting rid of the things that you don't need. So while I advocate for clear surfaces and encourage putting things away into cabinets and drawers when you can, a necessary component of that is having the cabinet space available for that purpose in the first place. Which means clearing out the unnecessary. I'll be back next week with the second part, the answer to how I maintain a minimalist, clutter-free and organized environment. What's your home style? Have you moved towards simplifying your space?